Welcome to our mix of articles that we post on industry topics and issues that we’re passionate about. Every once in awhile, we also share news and updates on our agency, people and happenings. Take a look and let’s talk. Onboarding a new employee is not all that different from acculturating an international professional who is relocating to your country. The latter has a good understanding of how to survive and thrive in their country, but they don’t know yours. Providing them with some background on the history and local culture will help them better understand certain behaviors and expectations that would otherwise be foreign to them. And while most streets around the world have traffic lights, lanes and pedestrian crosswalks, don’t expect the new arrival to understand how and why motorists and pedestrians move the way they do in your country. Likewise, after you hire a new employee, take the time to acculturate them to your organization and corporate culture. The first few months will be critical. This is the time to expect them to experience a steep learning curve and probably not the time to expect stellar performance as they get used to how your organization does things. This is the time where they will make mistakes, and it will be important for you to observe how they learn and recover from those mistakes. This will also be the time when they will experience some success. How they prepare for and embrace success within your organization will be critical. Dividing the introductory period into three months, i.e. the first 30, 60 and 90 days, helps incrementalize the learning process and acculturation. With each 30 days, the expectations rise, creating a desired trajectory beyond the final 90th day. This is also the time when the new employee will begin to find their ‘fit’ within your organization. The faster the fit, the faster their success will be. We’ve developed a simple set of four areas of focus, or quadrants, to help new employees find their rhythm, and for the company to assess their rate of development and potential performance in the future. Skills form the first quadrant and are usually the main reason employees are hired. Use this 30-, 60-, 90-day period to identify core skills and supplementary skills that can be nurtured in the future. Standards are different for each organization. The new employee may need to improve their performance after arriving to your organization but if they come from a superior standard, this is also the time to revise your standard guidelines. For some employees, a portion of their inherent skills may be undiscovered or undeveloped from their previous employment. Uncovering latent skills and talents may be an added ‘bonus’ for this employee. 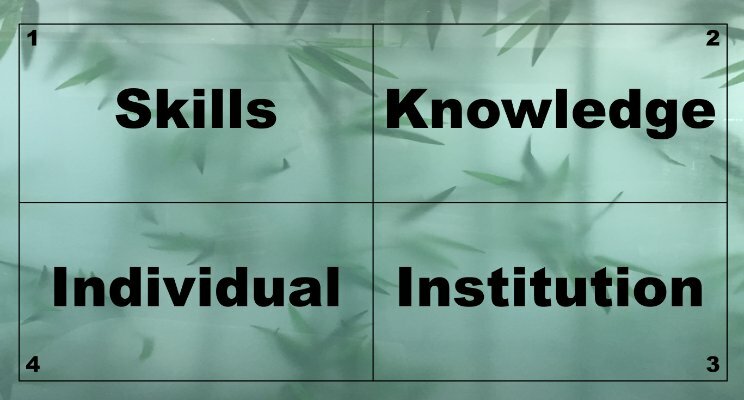 The second quadrant focuses on developing their knowledge and understanding of the industry and marketplace of your clients, customers, or if you are a nonprofit organization, those whom you serve. The marketplace is changing quickly, and so are the challenges and opportunities. Having a depth of understanding of the industry and marketplace keeps your organization relevant and allows for more innovative thinking in how you operate and provide value to your customers. The third quadrant is especially important if you don’t want an employee to ever say, “That’s not my job.” Understanding what makes your organization successful elevates their understanding beyond just doing tasks. This includes revenue generation, cost containment, service or product quality, and excellence as a team. Success in this quadrant also builds team spirit and pride, and binds your organization together. The fourth quadrant is last but definitely not the least of the priorities. It encompasses the personal career growth and development of each employee. This involves seeing and respecting them as an individual and professional – beyond just a member of a business unit or department. Encourage and nurture their strengths and prepare them to discover and embrace future opportunities. Instead of continually focusing on their weaknesses, help them remove threats to their career growth. There may be other areas of focus your company has for new hires, but these four quadrants are simple for the employee and supervisor to understand and grasp. In the first 90 days, the objective isn’t to instantly make the new employees into veterans, but to set the right trajectory for their success. When they are successful, you will be successful. Alan Tang is the chairman, CEO and president of Olomana Loomis ISC, an award-winning integrated business consulting, brand and marketing firm based in Honolulu, Hawai‘i.